"I see the goal. I reach that goal and then I see another." May these words carry meaning to the heart and mind of the disciple. It is said that Sagittarius governs human evolution, for the sun was in this sign when the Hierarchy began its Approach in order to stimulate the forms of life upon our planet. Again and again, we reenter the cycle of reincarnation through the sign Pisces and find our way around the great wheel until the experience of change and of mutability and the establishing of the transmutation process carry our consciousness from the instinctual and intellectual stages to the faint beginnings of the intuitive processes in Gemini. The one upon the reversing wheel in Gemini becomes more and more aware of the intuition, and increasingly under the influence of the "Brothers who live in the Light," as the twins Castor and Pollux, the two bightest stars in the constellation Gemini, are sometimes called. The light of the personality (Castor) dims as the light of the soul (Pollux) waxes. The fluidity of Pisces and the undeveloped Gemini gives place to the responsiveness of the personality to soul impression and consequent stabilizing of the life on the physical plane. Under Sagittarius influence, the ordinary person begins to demonstrate the tendency to become more focused, and the fluidity and relative negativity of Piscean energies become concentrated on the attainment of that which is desired. The person demonstrates one-pointed selfish instincts and though they may be, for instance, friendly and kind, it is through a desire for popularity. This is a good expression of the individual Sagittarian subject and shows also the tendency of the soul to turn all evil eventually into good. The lessons of life are being learned, and experimentation is going on. As more lives are experienced on the great wheel of incarnation, Sagittarius becomes the sign of the one-pointed disciple. The life of fluid response to matter becomes a focused response to spirit and preparation for initiation in Capricorn. The arrow of the mind is projected unerringly towards the goal. Sagittarius is sometimes depicted as an Archer on a white horse and a study of the meaning of this symbolism will reveal a great deal of inner teaching. This is one of the later ways of portraying this constellation. 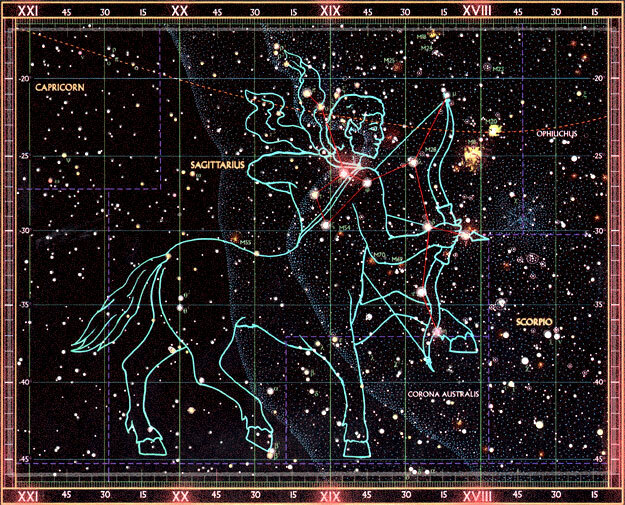 Earlier, from Atlantean days (the period from which we have inherited what we know about astrology), the sign was depicted by the Centaur ~ the fabulous animal which was half a man and half a horse. The horse symbolism dominated Atlantean myths and symbols, just as the ram and the lamb are prominently to be found in our modern presentations. This earlier sign of the Centaur stood for the evolution and the development of the human soul, with its human objectives, its selfishness, its identification with form, its desire and its aspirations. The Archer on the white horse, the more strictly Aryan symbol for this sign, signifies our orientation towards a definite goal. We are not part of the horse but are free from identification with it and are the controlling factor. The definite goal of the Centaur, the satisfaction of desire and animal incentives, becomes in the later stages the goal of initiation, which meets with satisfaction in Capricorn, after the preliminary work has been done in Sagittarius. The keynote of the Centaur is ambition. The keynote of the Archer is aspiration and direction, and both are expressions of human goals but one is of the personality and the other of the soul. From ambition to aspiration, from selfishness to an intense desire for selflessness, from individual one-pointed self-interest in Leo to the one-pointedness of the disciple in Sagittarius and then to initiation in Capricorn. The astrological symbol for Sagittarius used by astrologers is simply the arrow with a fragment of the bow depicted. The Archer as well as the Centaur have dropped out of the picture because the emphasis or focus of human living today is not based upon the objective outer facts of life upon the physical plane but upon some form of inner focus or emphasis, which varies from the many stages of astral ambition to spiritual aspiration, and from the activities of the lower mind bent upon selfish interest to the illumination of the same mind through focus upon the soul. The bow and arrow represent freedom or one-pointedness ~ the shaft of the arrow represents the necessary aspiration which returns to the sender as the arrow of the intuition. Sagittarius is one of the intuitive signs, for only the intuition will suffice to carry a man to the foot of the mountain of initiation in Capricorn. In the final stages of life upon the Mutable Cross, Sagittarius achieves the determination to "direct energy into another way of life and with ardour firm, mount another Cross" ~ the Cardinal Cross. Each incarnation that we find ourselves under the influence of Sagittarius, it is with the purpose of orienting to some new and higher objective, with the task of refocusing towards a higher goal and with the unfoldment of some basic and directing purpose. These developing purposes may range all the way from purely animal desire, through selfish human ambition, to the struggle of the aspiring disciple or initiate in order to achieve the needed liberation towards which the entire evolutionary process has impelled us. 1. In Cancer, Mass unevolved consciousness presents itself through instinct and desire. 2. In Leo, Individual consciousness emerges through intellect, and governing ambition. 3. In Sagittarius, Soul consciousness in its early stages unfolds through the use of intuition and aspiration. The first two initiations are covered here. 4. In Capricorn, Soul consciousness in its later stages is found through Illumination, and governing intuition. 5. In Aquarius, Soul consciousness gives way to Group consciousness using inspiration, and governing service. 6. Finally, in Pisces, Divine consciousness emerges through Identification, and governing liberation. Keynote: I and the Father are one. In Sagittarius, the intellect which has been developed, used, and finally illumined becomes sensitive to a still higher type of mental experience and to this we give the name, intuitive perception. There come flashes of light upon problems; a distant yet possible vision of attainment is seen. We begin to climb out of the depths of Scorpio and see ahead of us the mountain in Capricorn we know must be eventually climbed. We walk no longer in the dark, for we see what we have to do and we make rapid progress and travel "fast upon the Way." We "fly from point to point, searching for the arrows we have discharged." Figuratively speaking, we constantly have to dismount from the white horse ~ the developed and purified personality ~ and find where the arrows of intuitional aspiration will take us. We travel upon the "wings of the soul" (note the relationship to the winged feet of Mercury, the messenger of the Gods) and become, in our own personality, the winged God: Mercury, as you know, governs Gemini, the polar opposite of Sagittarius. This we do until we have established a balanced relationship between the personality and the soul, and can function as either at any desired moment with equal facility. In connection with the above, it is interesting to note that the Twins, set apart and unattached in Gemini, became the Centaur, the man-beast, in Sagittarius, for the opposites in the zodiacal circle express spirit and matter and their interrelation, plus the play of qualitative energies; they bear witness at the same time to the fact that these two are one and are simply the expression of great mutable, and yet fixed and initiated spiritual Lives. In the unevolved being, Gemini's changeableness and instability give way to Sagittarius's ambitious desire and focused direction. In the evolved being, soul recognition and interplay are found in Gemini, to be blended into Sagittarius's one-pointed spiritual aspiration and discipleship. Mercury rules Sagittarius's polar opposite, Gemini, and is the agent or the messenger of the fourth ray of Harmony through Conflict, while Jupiter, coming through Sagittarius and Pisces, is the medium for expression of the second ray of Love-Wisdom. These two rays govern the mass of humanity upon the Mutable Cross and are closely concerned with the incarnation of human beings. Their function is to fuse and blend the great dualities expressing themselves through humanity into one cooperative whole. It is easily apparent how, through the influences of Mercury and Jupiter, material desire can be transmuted into divine love, and the conflict which is the distinguishing characteristic of the human family can be instrumental in resolving dissonance into harmony. The definite pattern and direction of this process has to take form upon the Mutable Cross before the energies of the Fixed Cross can change the ambitious selfish person into the selfless disciple. All this has perforce to be initiated upon the Mutable Cross which is essentially and significantly the Cross of the mutable, fluidic, restless mind, and it is on this Cross that the mind nature is finally developed and begins its integrating control of the personality. When this process is proceeding, the Mutable Cross experience is over and the Cross of Discipleship begins to play its part. Sagittarius is a peculiarly human sign and is connected with the appearance of humanity upon our earth. Three of the zodiacal signs are more closely connected with the human than are any of the others. These are Leo, Sagittarius and Aquarius. They are related to the three aspects of body, soul and spirit. The signs will reveal divine intent, will mark the points of crisis in our progress and, when the three influences they express have done their work, will carry us "from door to door, for Leo is the next sign to Cancer, and Sagittarius is the sign which precedes Capricorn." Tuesday, December 21 at 12:13 am PST (10:13 UT). It is interesting to note that during the time we say the Sun is in Capricorn, this cycle from December 21, 2010 to January 21, 2011, due to the precession of the equinoxes, and from the Earth's perspective, the Sun is actually traversing the zodiacal sign Sagittarius. With this consideration, we invite you to review the SouledOut.org materials on Sagittarius freshly, from this perspective.